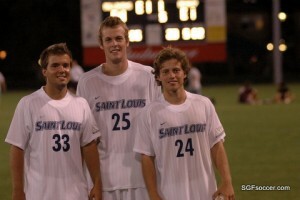 The Springfield Soccer Club is again well represented in the NCAA Division I Men’s Tournament which begins on campus sites across the nation on November 19, 2009. Last weekend saw several Springfield Soccer Club alumni representing their schools in the NCAA Division II and III Men’s Tournament and the NCAA Division III Women’s Tournament. Missouri State University Bears will attempt to garner their first NCAA Tournament victory as they take on the Saint Louis University Billikens at Hermann Stadium on Thursday November 19th with kick-off starting at 7:00pm. The Bears are represented by Heath Melugin, Nick Dryden, and Justin Scicluna. 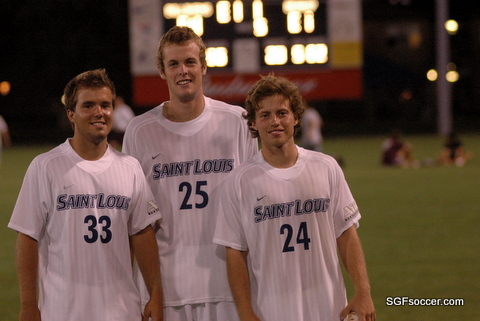 Across the field the Billikens will also have three Springfield Soccer Club alumni with Ian Newport, Devon Newport and Ryan Moses wearing the Billikens blue and white. Other NCAA Division I Men’s matchups will see Andrew Parsons and the University of New Mexico Lobos against the University of Portland Pilots. Northwestern University and Chris Tombridge out of the Big Ten Conference received a first round bye and will face the winner of Wisconsin-Green Bay and the University of Notre Dame. Drake University Bulldogs and Colin Lawter will have a first round game vs. Western Illinois University in Des Moines, Iowa on Thursday November 19th. Seeking their eighth NCAA Championship the Indiana University Hoosiers and Graham Basecke will begin post-season play by hosting the Cardinal from the University of Louisville. In the NCAA Division III Men’s Tournament Loras College will host Dominican University on Saturday November 21st in the round of Sweet 16. The Duhawks are seeking their third straight NCAA Division III College Cup appearance. On the Division III Women’s side Emily Jordan and the Concordia College Cobbers will have a Sweet 16 matchup vs. Lynchburg College out of Virginia on Saturday November 21st and the games are being held in San Antonio, TX. With April showers comes the start of Midwest Regional League (MRL) play for the 2-time defending state Champion Springfield SC U18 boys squad. The boys will face three familiar foes this weekend in St Louis, and I hope to see one or more of the games while also enjoying Easter weekend with Mom. Sunday saw the third straight shut-out for SSC as they defeated the Sockers through the air, on a fine run and finish (pictured above) and from the penalty spot. The first goal was scored by Ryan Moses as he rose above the defense to nod Tyler Bennett’s cross from the right side into the goal. That was in the 7th minute, shortly after Tim Griffin sent him in alone on goal and a shot that went just wide left. Late in the half, Devon Newport’s direct kick from 25 yards out went off the left upright but shortly afterwards, Griffin took it upon himself to expand the lead. Collecting a ball 40 yards out, he turned and beat his first defender. Continuing his run straight down the middle, with teammates making diagonal runs and calling for the ball, Griffin slid between two defenders as he ran into the box and calmly slotted his shot to the far side netting (pictured above) to make it 2-0. SSC expanded their lead late in the 2nd half when Devon Newport was pulled down in the box. The PK was taken by Ryan Moses who buried it underneath the keepers diving attempt to stop the ball. 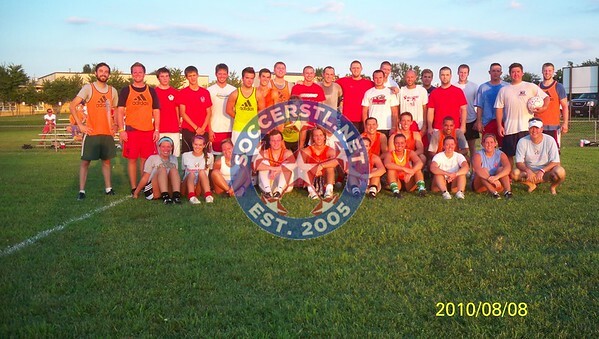 Saturday 3pm – Springfield SC 90/91 (MO) shut out their opponent, United 1996 International (KY) by the score of 2-0. Goals were scored by ? The boys look well prepared for their MRL season as the unspoken, and spoken, teamwork was working at a high pace this evening. Facing a familiar foe (I still remember that 1st game win against the Fever at the Region II tournament in Des Moines in 2007) they came out fast and hard. It led to a direct kick from 30 yards out in the 17th minute that was converted by Ryan Moses (SLU/Kickapoo) as shown in the video above. 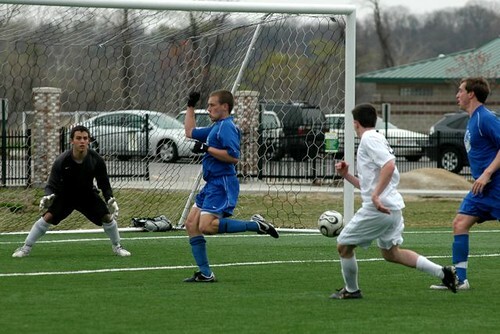 Ian Newport (SLU/Glendale) scored from the spot in the 61st minute for the final margin. A good weekend results-wise for the boys but I know Coach Cory Carr would have liked to see more. I’m going to dig into the USSF Academy program sometime in the next few weeks. This was not the same team I saw in June 2007 when the boys beat the Sockers 3-1 to get into the Regional semifinals, as the Sockers have moved many of them into the Academy team. And if the boys are going to go beyond the Regional semifinals this year, they can’t be pulling back now. I’ll have more photos, including a Socker’s album, later this evening. For now it’s time to go enjoy Easter with my family. Happy Easter to all! Devon Newport scored 4 goals and moved into second on the Falcon’s Career scoring list for goals in a single season. Patrick Baltz (3G), Ian Newport (1G/1A), Chris Maddox (1G), Ryan Partch (1A), Ryan Harbach (1A), Josh Hunt (1A), Graham Basecke (1A) all earned points as well. 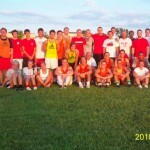 The Tigers received goals from five different players in a 9-0 win against their new Central Ozark Conference rivals. The Tigers are now 13-2 overall and one step closer to their first ever conference championship. Carthage is 5-0 in the COC with one conference game remaining against Nixa. While Bolivar jumped out to an early lead with a pair of goals, the Jays fought back and tied the game in the 50th minute. The game winner came in the 92nd minute, it was the third of Kyle “toad” Slagle’s goals on the evening. Slagle got the game winner on a 60 yard free kick. Toad took the kick from beyond midfield. The ball bounced once, Matt Magana, the keeper and a defender all went up for the ball. The keep got his fingertips on it, but the momentum carried the ball into the net for the golden goal! In a hard fought battle, the two Conference rivals went toe-to-toe and both came away disappointed tonight. The Chief’s goals were both scored by junior Skyler Russell as Kickapoo’s new 4-3-3 formation brought them the offensive output needed to win the game. Russell’s first goal was scored in the 25th minute as he moved across from his wing forward position and challenged for a ball. Upon winning it, he quickly turned back before unleashing a 25 yard shot that skipped past the GK’s outstretched arms. The Laker’s surprised the Chief’s as well, coming out early in the 2nd half and getting a game-tying goal in the 49th minute from senior forward Jeff Moffitt. It stayed knotted at 1-1 as both goal keepers played very well, with junior Ryan Moriarty for the Laker’s making some fine reaction saves in the box including one against Ryan Moses from 6 yards out. 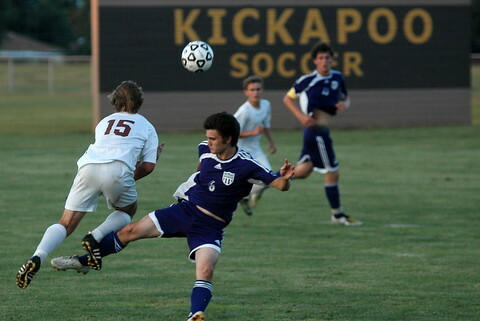 Kickapoo’s Chris Tombridge patrolled 40 yards beyond the endline for the Chief’s in blunting several counter-attack efforts by Camdenton as well as a point blank shot by Rayder Bennett. The game winner was a beauty, scored in the 53rd minute when senior Ryan Moses sent a 50 yard ball into the Laker’s goal box. Russell ran under the ball, shielding the defender as he positioned himself to control the ball. Or so the defender thought, as the left-footed volley blew past the goal keeper from 15 yards out. Russell also attempted a bicycle later, as the Lakers were caught napping on a throw-in, but the keeper responded to the challenge. Bryce Collier scored unassisted for Hillcrest, earning them the early lead. Parkview came back however with five goals to earn the win. Tim Griffin had 3 and Jared Moore and Vance Marlow each added a goal. In a game that went to PK’s following two OT’s, the Yellowjackets prevailed at home. Ethan Hunt scored for the Zizzers, #7 for the Yellowjackets – Lebanon Senior Kyle Strief, defender, scored on a header off of a corner, also scored the winning PK.